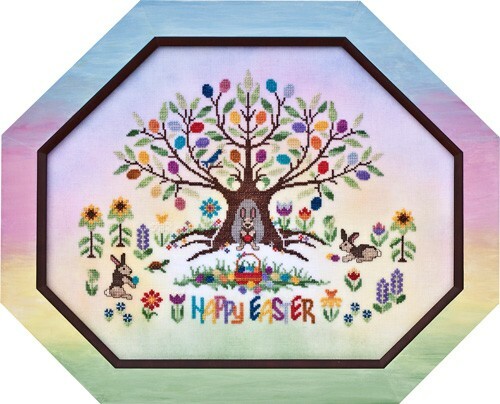 A tree of pastel eggs and curious little bunnies in a colorful meadow of flowers. New “Over the Rainbow” fabric by Crossed Wing Collection custom dyed specifically for this design. General Information: Stitched using 1 thread of floss over 2 threads of fabric. With the exception of six 1/4 stitches that can be found under the bird’s feet, the design is stitched entirely in full stitches. Fabric: Stitched on 28ct “Over the Rainbow” Linen hand-dyed by Crossed Wing Collection. If using the recommended linen by Crossed Wing Collection, a custom cut of 20″w X 18″h is available below. Design Area: 14″w X 11-1/8″h. Fibers: A total of 19 colors of Dinky-Dyes 600d silk floss and 1 color of Sullivans floss (for backstitching) were used in the model. Dinky-Dyes 600d silk floss is similar to No. 12 Pearl floss. A floss pack for this design is available which is much more economical than purchasing individuals cards. DMC and Anchor comparable colors are also provided. No other fibers or embellishments are needed to complete the project.